WARNING: Spoilers ahead for Star Wars, especially episodes VII and VIII. Fatherhood is deeper in the Star Wars DNA than Light Sabers, deeper than the Force and the Light and Dark Sides. It's the thematic backbone and nerve center of the whole mythology. Starting from Obi Wan, and going outward in either direction, you can see how the Patriarch is implicated in every mythical moment. Obi Wan is the keystone of the first six Star Wars films. 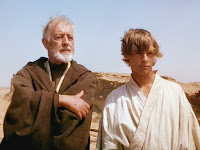 We are introduced to Obi Wan as mentor to Luke, through whom Obi Wan hopes to redeem himself. Obi Wan's training (continued by Yoda) allows Luke to face his own father, eventually becoming Vader's mortal enemy, echoing the patricidal impulse that the Sith swear by (the Rule Of Two). The original trilogy is resolved, in episode 6, when Luke refuses the patricidal role that seems to be his destiny: refusing to destroy his father, even at the most decisive moment, he effectively breaks the murderous chain that runs through every Star Wars. If you trace the line of fatherhood from Obi Wan in the other direction, you find, in the prequels, Anakin the fatherless, rebelling against one father-figure (Obi-Wan) and ultimately destroying another (Emperor Palpatine). Anakin, the fatherless, the betrayer... from his betrayal of Obi Wan, unto his redemption, the betrayal of Supreme Leader Darth Sidious. And of course, in Kylo Ren, Anakin finds an analogue. And so, fifteen years go by, and then come Star Wars VII and VIII, proudly restating the themes of their predecessors. Kylo Ren is Vader with his mask off: the tortured product of a compromised ideology, following in Anakin's footsteps as the consummate patricide (first Solo, then Snoke). He is a creature of naive idealism, twisted into a reactionary when faced with the imperfections of his symbolic order. What of motherhood? Of the masculine, we've seen much... but of femininity, all we've seen, in Episodes I-VI, is maidenhood. The only mother who has any role in character development is Shmi, and she is effectively a disposable device, part of a section of backstory clumsily soldered to the Clone Wars narrative arc. At the very least, we saw that the death of his mother was the first trigger for Anakin to drift toward the dark side (though it may have always been within him). In a sense, Anakin was a failure of nurturing, an id conditioned entirely through the one-sided application of austerity, specialized training, and detached spirituality. So we might take the license of really reading into that: the whole story, from episodes I through VI, is the story of a universe without motherhood. It is only in Episode VII and VIII that motherhood stands up and makes its return. 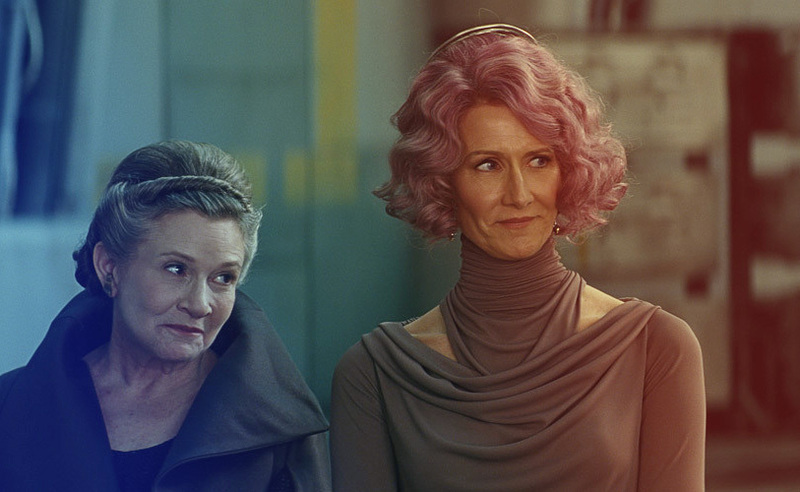 Leia Organa is the motherhood of strength and survival, Maz Kanata is the motherhood of the concerned bystander, and Amilyn Holdo is the motherhood of secondary relations, the aunts and godmothers and best friends of the world. This motherhood includes both survival and sacrifice, two dominant themes of Star Wars Episode VIII. In Episode VIII, Luke returns, and through Luke and Kylo Ren, the fatherhood theme continues its critical role. However, Luke Skywalker, now a hermit sage, drives a massive shift in momentum: he hesitates to become the father figure, and when he finally does, he is the ghost of a dying ideal. His critical contribution is a duel with no intention of winning; his final gesture is to fade away and vanish altogether. FIRST, that the fatherhood complex is toxic... it has always been about ideological purity and passivity (the Light), or about envy and murder (the Dark). SECOND, that the new virtues must be wholly different: the virtues of survival and sacrifice and rebirth. These are the virtues championed by the maternal spirits, and they are the stamps of destiny upon Rey, the orphaned female successor to the Jedi philosophy. And still carrying this thematic burden, despite her tragic loss: Carrie Fischer as Leia Organa, forever the survivor, sending severed tongues to abusers, always shattering her stereotypes: the princess, the sexual chattel, the hysteric. Carrie Fischer, who seemed so linked to her own mother that the latter followed Carrie into the dark. And so, we can follow Star Wars, one of our greatest mythologies, into one of its greatest discoveries: that motherhood survives and blesses our successors with their survival, and fatherhood finally learns when to let go and overcome itself, dissolving back into history.